I remember a time when a trip to Bellingham meant a visit to Royal Fork, K-Mart and the newly opened Bellis Fair. Ah yes, that was indeed a long time ago. So there it was, my entire childhood memory of Bellingham would be one place to eat and a few places to shop. Fast forward to the present and yes, there is much more to the place other than Target, Walmart, Old Country Buffet and Trader Joe's. Taking a page out of the Lion King, "you must look beyond what you can see". I wish Viv would take that advice and look beyond Ross... What a complete gong show there... 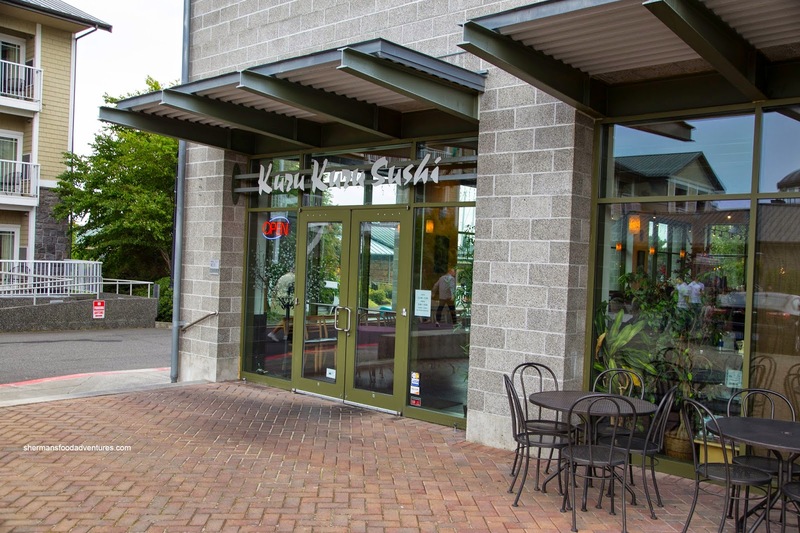 Since we were renewing our Nexus cards in Blaine, we headed over to Tom Glenn Common on the Bellingham's waterfront for some conveyor-belt sushi. No, that doesn't exactly roll-off-the-tongue when one thinks of Bellingham, but then again, remember to look beyond what you can see... Yes, you there, drop the 2-buck Chuck! So we ended up sitting right at the bar to the kiddies delight as they were mesmerized by the assortment of plates going by (different colors = different prices). 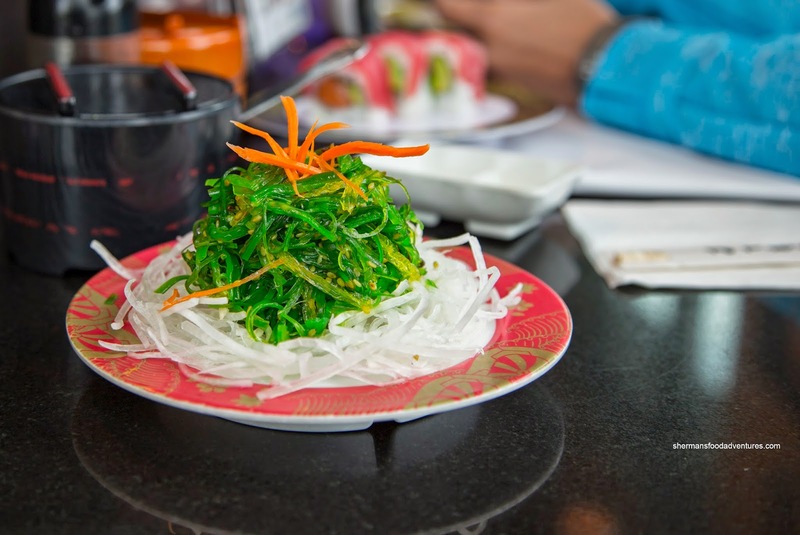 We started off simple with a Wakame Salad on top of shredded daikon. Nothing amiss with this large portion for $2.00. Textures were crunchy while the familiar taste of sesame oil, sugar and rice wine vinegar hit our palates. 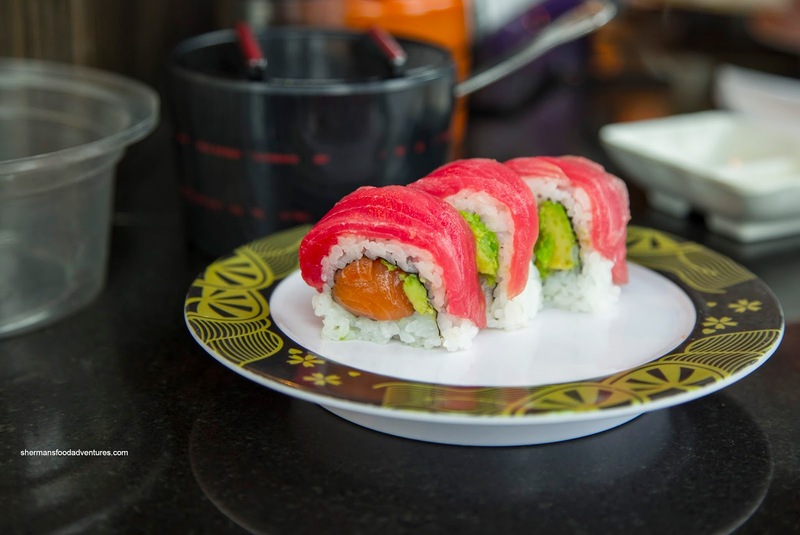 Onto some sushi, we tried the Cherry Blossom consisting of salmon and avocado topped with red tuna. I found the rice a bit underdone, but reasonably chewy. It was rather bland though with not much in the way of sugar or rice wine vinegar. As evidenced in the picture, the ingredients were decent texturally and appealing visually. 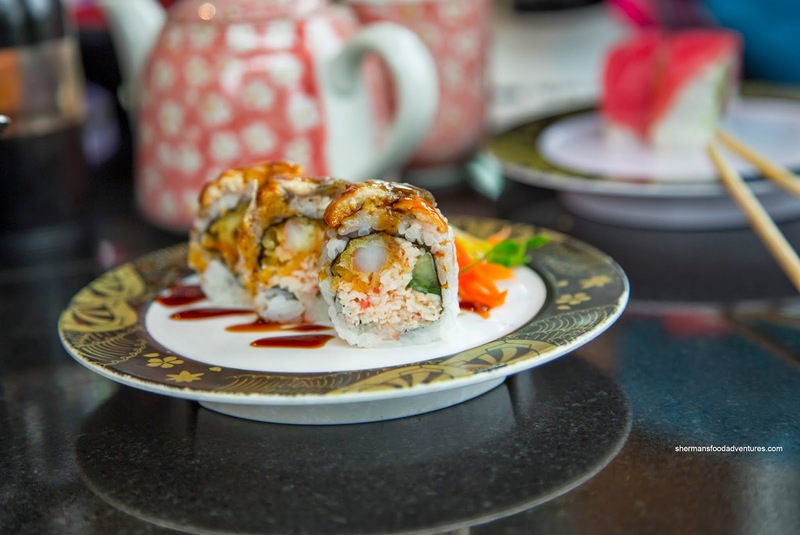 Next up, we had the typical Dragon Roll made of imitation crab, ebi tempura and cucumber topped with unagi and sauce. I liked how there was a thin layer of sushi rice which meant there was much more in the way of ingredients (and topping) than filler. Nothing particularly interesting about the roll other than it was decent with no issues. 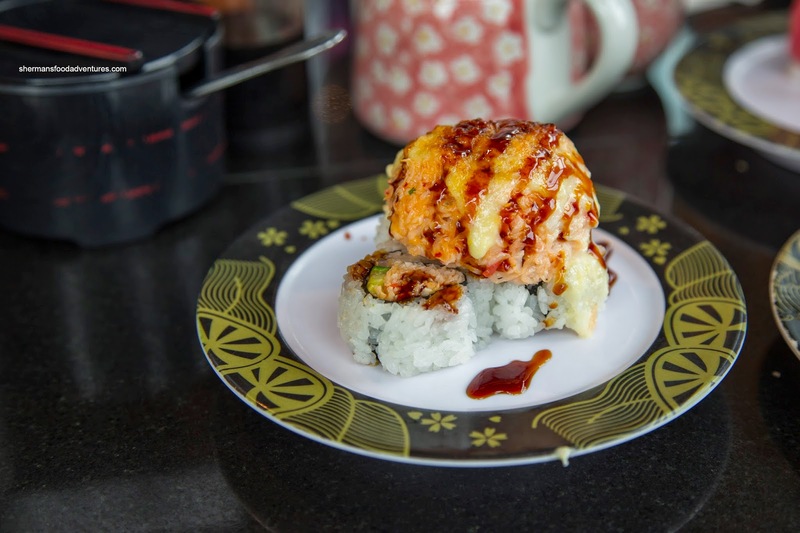 With a big ball of baked imitation crab, the Baked Scallop Roll was more probably mis-named. Yes, there was a few baby scallops to be found somewhere in the large sweet mayonnaise and imitation crab concoction, but this was hardly a scallop dish. Despite that, it was hearty and pleasant enough with 3 Cali-rolls underneath. I did find it a bit too sweet though. 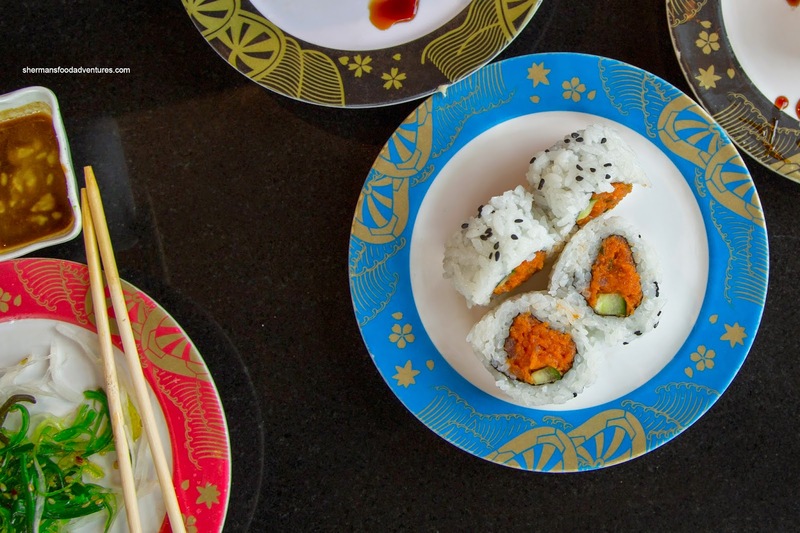 If you haven't already noticed, the specialty rolls were mostly on black-rimmed plates priced at $3.50. Not particularly unreasonable, but worth mentioning as these were the best items to choose from. Continuing on, we had a more modest maki roll being the Spicy Tuna on a blue plate ($2.50). As simple as this was, it was not bad. There was a bit more sushi rice with this roll, but that was okay since the tuna was indeed spicy. Texturally, it wasn't mushy, rather, there was a meatiness to it with the crunch of cucumber. 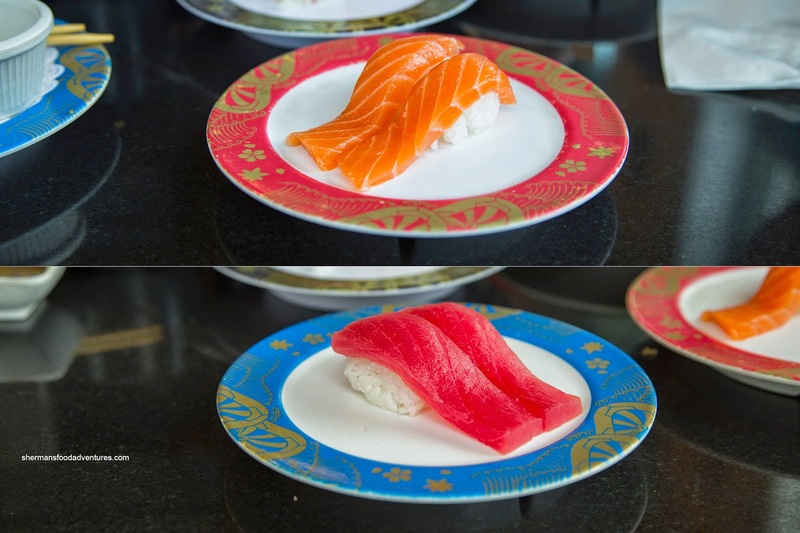 With interesting items waning, we went with one order each of the Salmon and Red Tuna Nigiri. The fish-to-rice ratio was a little off where there was more fish than rice. I'm sure not many people would complain about that, but for me, I personally like my nigiri to be balanced. With that being said, there was nothing much more to dislike about the nigiri other than the mild-tasting rice (that was a touch underdone). 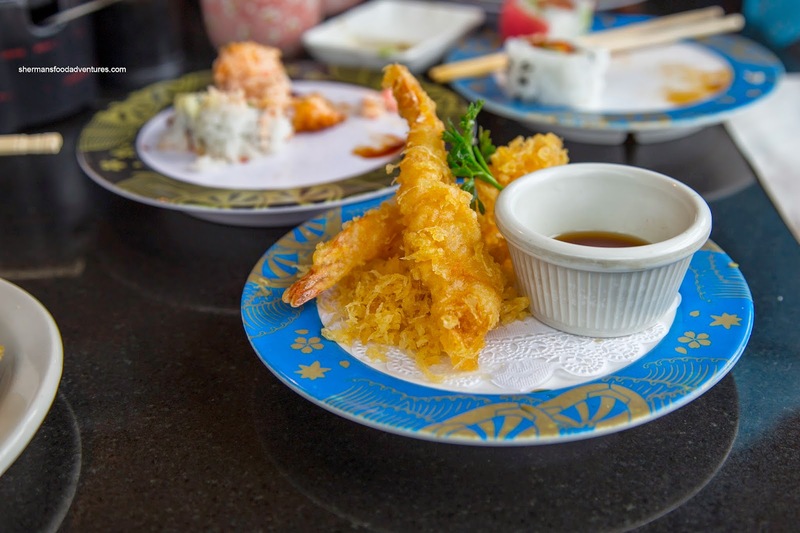 For the kiddies, we got a couple orders of the Ebi Tempura as well as an Udon in soup (also with a side of one ebi tempura). The large ebi were coated with probably a bit too much tempura batter as it was thick and super crunchy. Inside, the ebi was meaty with a light snap. I guess it wasn't aesthetically-pleasing to look at, but it ate okay nonetheless. 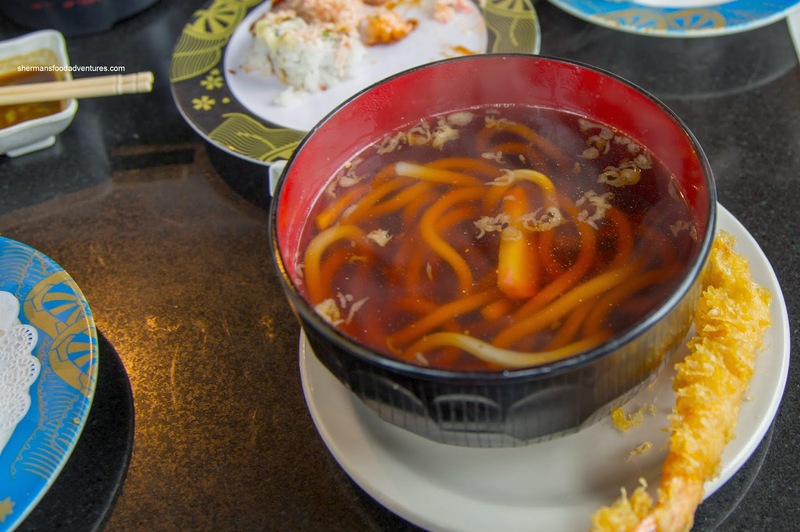 As for the udon, there was much more dashi than actual noodles. However, for $3.95, we weren't expecting much. Somehow, they added the togarashi red pepper flakes into the soup in the cooking process. Usually, this is served on the side. Hence, the broth started out sweet with an Earthy flavour while finishing off spicy. I didn't mind it, but my son, not-so-much. Smoked Calamari Salad which was surprisingly good as the smoke really came through while the squid itself was tender with a bite. The addition of pickles and wood ear mushrooms provided a nice crunch and acidity. Lastly, we got an order of the Popcorn Shrimp for the kiddies and it was pretty standard stuff. 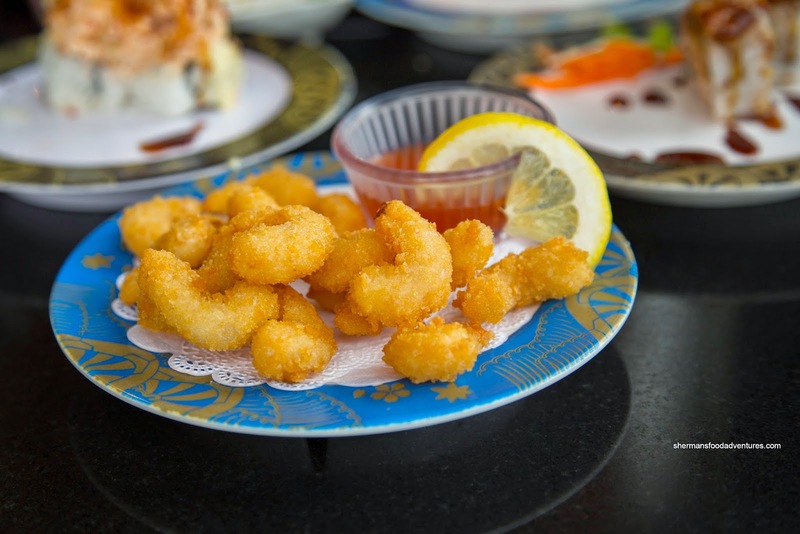 With small shrimp coated with a crunchy breading, it was a good alternative to the tempura. After it was all said and done, the bill was fairly reasonable for the amount of food we had eaten. It wasn't great, but it was actually better than we envisioned it to be - definitely serviceable. Also, the service was pretty good as well. Haha, you went to Kuru Kuru. It's definitely a family (read: KIDS) place. And yeah, we've been there several times. My son likes the conveyor belt (what kids don't ?). The food ..... ok 'nuff and not offensive, and the low prices help. 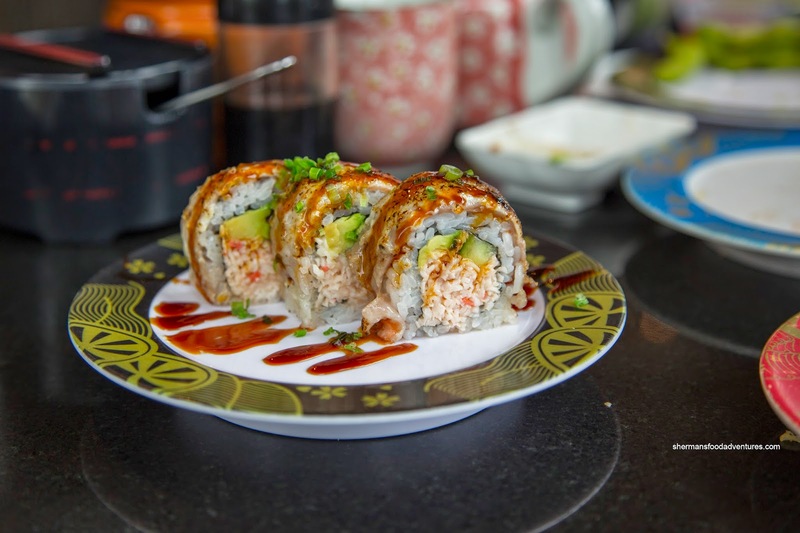 I get a kick how they love using tempura batter crumbs on so many rolls. Novelty at first, but you get tired of it quickly. 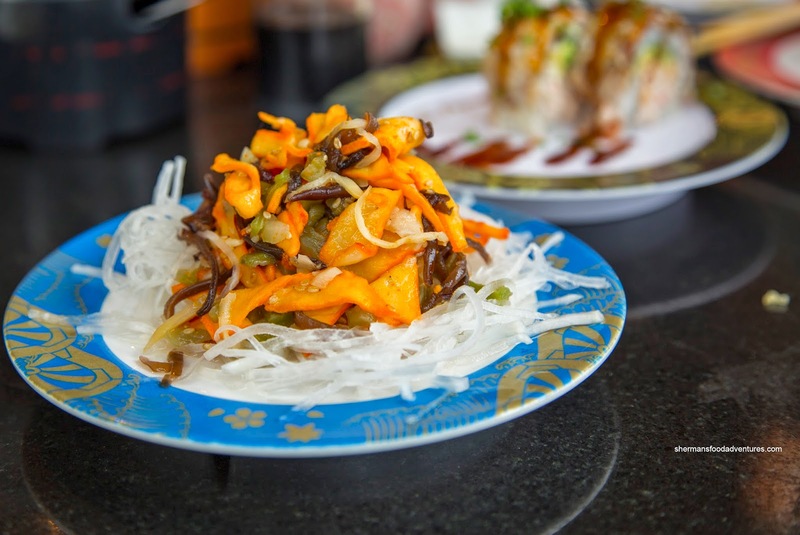 But we like the surroundings (Bellwether) and other than Blue Fin Sushi, there's not a whole lot of decent Japanese eats in BHAM. BTW, I discovered this true hole-in-wall Korean-American joint called Super Duper Burger. Go for takeouts only. Excellent teriyaki and katsu at fast food prices. Just east of Fairhaven, on Harris @ 21 St.
@LR I'm only touching the tip of the iceberg when it comes to Bellingham food. Sure, there are not many great places to choose from, but I intend to try most of them someday!